A legendary drag queen, a former First Lady and a pop-chanteuse all pose together for a snapshot. 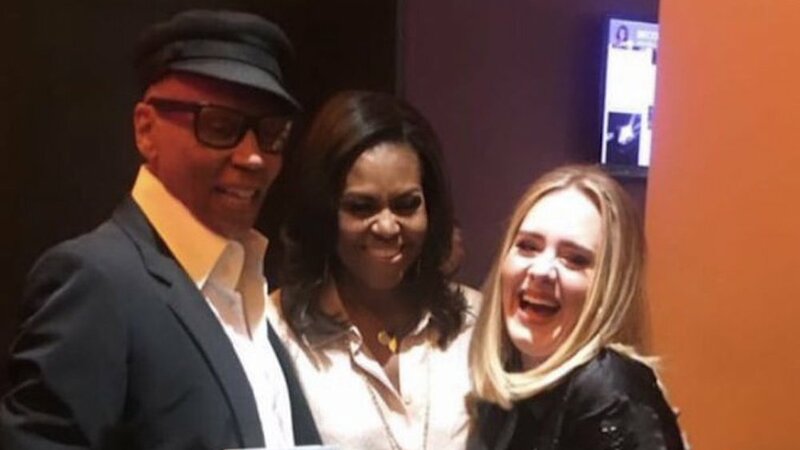 No, it’s not the setup for a cheesy joke — it’s something that actually happened last night between RuPaul, Michelle Obama and Adele. The snapshot occurred last night after Obama was interviewed by Stephen Colbert, the late night TV host, at the O2 arena in London, England. The interview, reportedly attended by over 15,000 people, was for Obama to discuss her memoir Becoming. Gay Star News reports, “RuPaul is in London for the filming of Drag Race UK,” and the photo of the three together suggests that Adele might actually be a guest judge on the show. RuPaul was interviewed by Colbert in January 2018 after she won her second Emmy for Best Outstanding Reality Host for RuPaul’s Drag Race. During the interview, Colbert mentioned RuPaul’s marriage to Wyoming rancher, Georges LeBar. The two met in a now-defunct New York City club called The Limelight in 1994 and married during their 23rd anniversary. Meanwhile, this is just the most recent public outing by Adele. In late March, the singer went out with actress Jennifer Lawrence to the New York City gay bar Pieces. There, the two joked with drag queen Brita Filter and Adele played a drinking game. Later, Lawrence tackled her onto the floor. This is how it should be! We are all human beings!